There are several things I liked to do, but you asked me ‘Hobby’ so … making pop-up cards was one of them. I made a card which a baby comes out from it or a director chair becomes 3D when the card was opened for a film director wanna-be. It was a fun process to think how to construct the shape and it was a pleasure when it worked as planned. I might start making it again sometime. The thing I always say to myself is ‘it’s better to regret something I have done than the things I haven’t’. The thing I want to say to other people is ‘keep having a good friendship’. Last year I found my old classmates from the secondary school gathering on Facebook so I joined the group. So many years have passed since then and I had no idea where these people were. One of the members has just come to visit London. It was great! We never stopped chatting. Is this question about me? OK, if it is, personally I want to move to a different house. And I want to start doing some kind of food related work. I hope Health of all my family and friends particularly my mother’s will stay the same (or even better) for next ten or more years. If it is about anything, I hope that we will keep the Constitution of Japan that we cannot fight in another country. We should be really proud that we never allow ourselves to join into any war. All the countries should follow us too. The difference I want to see is that the World would become safer and peaceful without any hatred among any races or countries. I strongly hope all people will change the attitude towards nature and the Earth becomes much greener. I hope nobody poaches any wild animals for fun or in order to use them for ‘non-working’ conventional medicine and ivory. So, I have to nominate some Blogs/people now. I don’t know many bloggers yet but there are some blogs I particularly enjoy reading. They are all established Blogs so they might have been already nominated before. Even if it is so please accept the nomination from me. gardeningB – This blog is about Beatriz’s edible garden in Florida. She reports amazing exotic plants and fruits she grows in her own garden. She sometime talks about some animals such as peacock and rascal squirrels with her sense of humor. I Need Feed – Nell creates amazingly delicious food especially Gluten Free sweets. All the posts come with beautiful mouth-watering photos. It seems like she is going into savoury meal section in the near future so I am looking forward to her new posts. Margaret Ellis – Margaret writes in wide range of topics and finds interesting photogenic subjects/people to take pictures. Her blog is all about her adventures from traveling to relationship or exciting life with interesting friends. She is a very energetic person and very inspirational! I’d like these three people from the blogs above answer to my questions below. 1. What do you do to keep fit? 2. Which do you prefer living by the sea or in a mountain? 4. If you can be a character in a film which character/film you want to be? 5. What is the craziest thing you have ever done in your life? Thank you. It’s my pleasure! 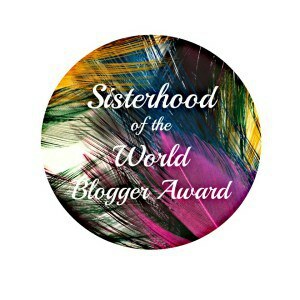 Pingback: Sisterhood of the World Blogger Award | I Need a Feed! Matsumi, thanks for nominating me! I am formulating a response that I will post this week. My pleasure. Will be looking forward to the post. Keep it up! And I loved reading your responses. I got a fabulous mini look into a little more of you! I enjoyed how you interpreted the questions from different angles. Pop-up cards sound like fun! Do you have any photos? Your advice about regretting things you’ve done instead of things you haven’t is smart. I’ve been regretting moving cities and your words have changed my thoughts. And the constitution… it really is nail biting. My hope is that someone will stop this craziness for good but I’m concerned, especially after the state secrets bill was jammed through. Now off to read sweeter things! Thanks Hilary, I’m glad my advise made you feel better. Regarding the pop-up cards, I probably took some photos of them but that was log time ago … before digital camera became widely available. They are somewher in some drawers. I have to search. Oh yes! I’d love to see photos of your pop-up cards if you find photos, but I know what you mean. I’ve got tons of photos in boxes that I’d love to scan but it seems to be too much effort sometimes. Thank you! Lovely to hear from new people. Pop-up card is very fun to make and receive. Do you have any photos of them? and I should try going to have the duck you recommended sometime.